Sony has announced today the successor to their A55 camera, the new Alpha A57. This interchangeable lens model features up to professional grade DSLR performance, but is also suitable for entry level hobbyists. 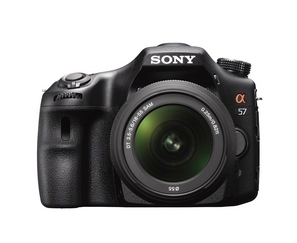 The A57 includes Sony’s “Translucent Mirror Technology” (SLT) which is a step between full DSLR and mirrorless in that the mirror “is semi-transparent, allowing the majority of the light to pass through to the sensor whilst reflecting a portion of it onto a phase-detection autofocus sensor” (Wikipedia). In addition to the SLT, the camera will shoot up to 12 frames per second, captures full HD video at 60p, 60i and 24p frame rates, features 2x digital “Clear Image Zoom” (but still digital zoom) and 11 different in-camera effects (including Pop Color, HDR Painting, Miniature Mode and Auto Portrait Framing). The Alpha A57 will be available in April with a 18-55 mm kit zoom lens for $800 and body only for around $700. This entry was posted in Camera Announcements and tagged a57, alpha, SLT, sony. Bookmark the permalink.